I’m not sure how, but a little while ago I got talking to John Cinnamond about an experience of mine with Haskell that didn’t exactly end well. As some of you may know, I made a terribly-promoted, mostly-unused (except by me) application called Over The Finish Line. 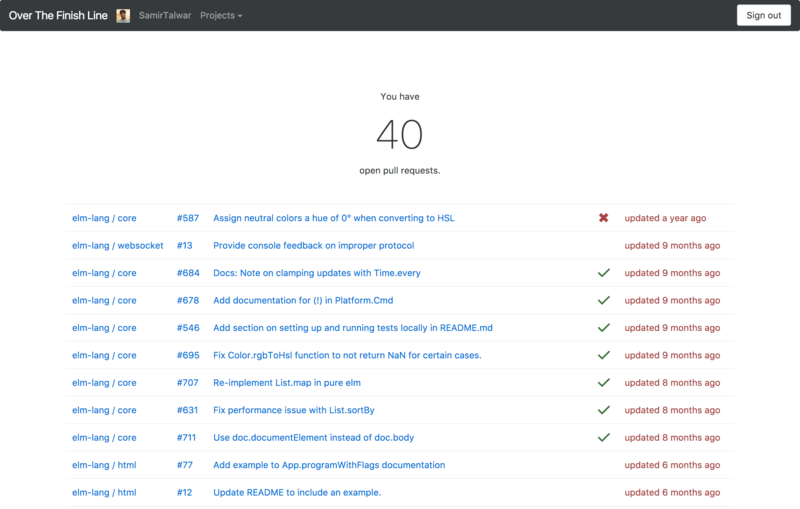 It displays open pull requests on your favourite repositories in a dashboard format. I think it’s pretty neat. It doesn’t get much love nowadays… but I’m getting ahead of myself. I was at GameCamp this weekend, learning more about how to design games. I love the GameCamp community. More than anything, it’s inclusive: if you’re there, you must like games, and we like games too, so let’s talk about games! So we talked about games. And something came up that I’ve never considered before. Games, especially video games, provide the opportunity for something special: they allow the player to say and do things they’d never even consider in real life. This is often linked to the violence in many AAA titles, but there are way more interesting examples. In video games, you can talk about things you’ve never experienced, like coming out to your parents (that example was brought up in one discussion). You can do things you’ve never done, like throw yourself off a mountain while strapped to a snowboard, or dive through the window of a moving car. You can consider possibilities you never knew existed. We can do these things in games because they’re safe: if you don’t like the outcome, you can restart, rewind or reload. On Monday, I gave a talk at Codemotion Berlin entitled… well, it’s a long title. I don’t need to say it twice. Anyway, I thought you might be interested in reading it. Yes, reading it. My talks are essays first. Apologies folks. I wrote this ages ago and apparently never published it. Well, late is better than never, so here it is! You may want to remind yourself of Docker Compose and The Guts Of Docker Compose first. Once we have a container, we can run it on a server. Of course, we need to get the container images there first. This is where continuous integration comes in. a.k.a. ALL OF THE BUZZWORDS. You know, it’s been so long I forgot how my blog works. Time to remedy that. I gave a talk last month at DevOps Linz entitled “Staying lean with application logs”. On the day, I came up with the far more click-baity one above. People came to beautiful Wotton House, the new venue for SoCraTes UK, from all over Europe. This post isn’t really about Docker, except that it is. It’s generally considered good practice to log everything in your application that might be useful. When you’ve separated parts of the application into different processes, or even worse, distributed it across several computers, logging becomes even more important, as tracing an event through multiple systems isn’t easy by default. The first thing to remember is that if it’s important, log it. Treat your log as an event stream. Ideally, you’ll be able to reconstruct your database just by replaying your logs. When working on a Ruby project, it’s tempting to just install the gems with bundle install and get to work. While Bundler is pretty good at ensuring you only use the gems you specify, and that you get the right versions, you still end up with a ton of gems in one directory with no way to identify which ones you need and which ones exist for projects you don’t maintain any more, or are older versions of gems that you’ve updated. I’m working on a side project to help with a common problem: doing too much at once. I strongly believe that a productive team tries to focus on one thing at a time, and that juggling several pieces of work is the sign of an overloaded, badly-managed or underperforming team. To figure out useful proxy metrics for too much “work in progress”, I surveyed people on Twitter and the Software Craftsmanship Slack to find out how they measure it. Here’s my distilled results. I’m sure I’m not the first person to do this, but I’ve never heard anyone else explain it explicitly, so here’s my take on it. This was originally part of a discussion on the Software Craftsmanship Slack organisation. Ninja pairing: you arrive, you pair, you depart, and no one even realises you were there.